On January 13, 2009 there were 1016 potentially hazardous asteroids. On January 17, 2009, there were 1017 potentially hazardous asteroids. On February 13, 2009, there are 1025 potentially hazardous asteroids. On February 25th, there were 1029 potentially hazardous asteroids. On February 28th, there were 1032 potentially hazardous asteroids. On February 25, 2009 there were 1029 potentially hazardous asteroids. similar image shows Iridium 33 debris, and other views are available, too: #1, #2, #3, #4, #5. These maps reveal in full what earlier, less complete maps strongly hinted: Kosmos debris is scattered more widely than Iridium. "Kosmos fragments range in altitude from 250 km to 1690 km," says Deak. For comparison, "Iridium fragments range only from 525 km to 1092 km." Kosmos fragments descend all the way down to the 350 km orbit of the ISS. The space station is in little danger, however; most of the Kosmos scatter is over the Antarctic where the ISS does not go. The fragment count now stands at 354. Says Deak, "there are surely more to come." FEB 28th UPDATE: Since these maps were posted on Feb. 26th, the catalogued fragment count has jumped from 354 to 414.
: #1, #2, #3, #4, #5. The nucleus of Comet Lulin spews a mixture of dust and gas into space. Quickly, the mixture separates into two distinct tails: The gaseous "ion tail" is pushed straight away from the sun by solar wind. 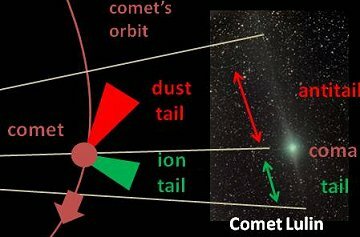 The weightier dust tail resists solar wind pressure and aligns itself more or less with the comet's orbit. The next image shows why the ion tail disappeared: It is temporarily hidden behind the comet's head. And finally we see Tosar's prediction for the future: The ion tail will re-appear during the early days of March. The two tails, ion and dust, and sometimes called the tail and the antitail. OTHERWORLDLY SOLAR ECLIPSE: For the first time, a spacecraft from Earth has captured hi-resolution video of a solar eclipse while orbiting another world. Get the full story from Science@NASA. "We photographed the launch using an AllSky-340C mounted on our roof," says Matt Thomas of Santa Barbara Instrument Group. "It monitors the sky 24/7, and you can see live images here." Unfortunately, OCO never made it to Earth orbit. After the satellite left the field of view, above, it failed to separate from its Taurus XL launch vehicle. The stuck-together pair splashed down in the icy waters near Antarctica. Climate scientists are calling the loss a "serious setback" in their efforts to identify our planet's carbon sinks and solve the mystery of missing carbon--the 30% of human-produced carbon dioxide that disappears into unknown places. A NASA panel has been convened to investigate the mishap. COMET LULIN UPDATE: Comet Lulin is now receding from Earth, but observers say the comet is still bright enough to see with the unaided eye from dark-sky sites. It looks like a faint patch of gas near Regulus, a 1st magnitude star in Leo: sky map. "The image is a median stack of 50 three-minute exposures," says Brimacombe. "What an endlessly surprising and beautiful comet Lulin has turned out to be." Note: Yesterday we suggested that the gaseous ion tail of Comet Lulin had been torn away by a solar wind gust on Feb. 23rd. That may be, but another phenomenon is at work, too. The ion tail is at least partially hidden behind the comet's head as the comet swings past Earth. Rapidly changing geometry will soon bring the unruly tail back into view--if indeed it is there. couldn't detect the ion tail even in a deep 24-minute exposure," reports astrophotographer John Nassr, who took the picture on Feb. 24th from his private observatory in the Philippines. Comet Lulin now resembles a great green Q-tip! A three-day sequence of photos by Nassr reveals what happened: Apparently, a gust of solar wind disrupted the comet's gossamer ion tail. 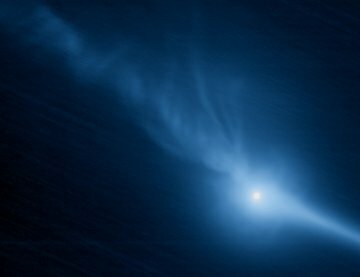 Meanwhile, the comet's heavier, spike-shaped dust tail was not noticeably disturbed. This has happened at least twice before in January and February, and each time the ion tail rapidly grew back. 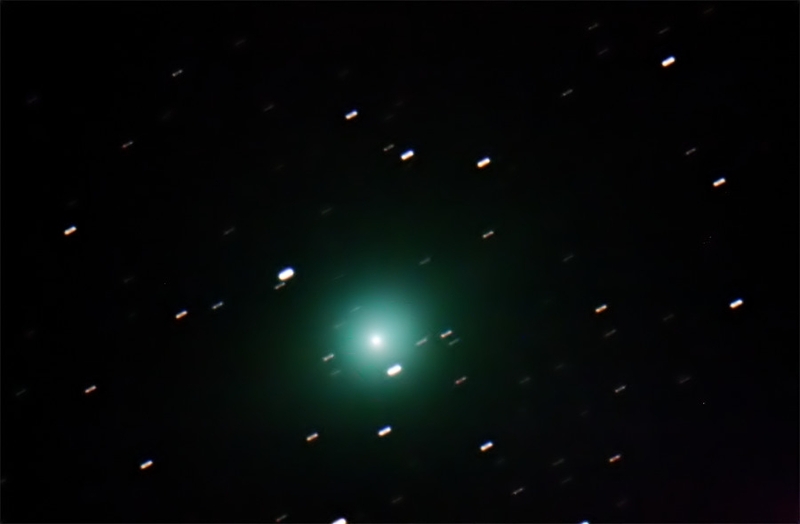 UPDATE: A high-contrast movie of Comet Lulin recorded on Feb. 25th by Filipe Alves of Play it! 2-24-09 NEW SUNSPOT: The Solar and Heliospheric Observatory (SOHO) is monitoring a sunspot now forming in the sun's northern hemisphere. The spot's high latitude and magnetic polarity identify it as a member of new Solar Cycle 24. Readers, if you have a solar telescope, now is the time to watch sunspot genesis in action. DOOMED SNOWBALL: on Feb. 23rd, the Solar and Heliospheric Observatory (SOHO) watched a comet plunge into the sun and disintegrate. The doomed snowball was a member of the Kreutz sungrazer family. Named after a 19th century German astronomer who studied them in detail, Kreutz sungrazers are fragments from the breakup of a giant comet some 2000 years ago. More than a thousand of these fragments have been catalogued by SOHO since the observatory was launched in 1995. Most are small and faint, but this one was a beauty. Watch the movie. COSMIC COINCIDENCE: What are the odds? On Tuesday morning, Feb. 24th, Saturn and Comet Lulin will converge in the constellation Leo only 2o apart. At the same time, Comet Lulin will be making its closest approach to Earth (38 million miles), while four of Saturn's moons transit the disk of the ringed planet. Oh, and the Moon will be New, providing dark skies for anyone who wishes to see the show. All you need now ... is a telescope. UPDATE--SPEEDING COMET: "Last night (Feb.21) Comet Lulin was visible to the naked eye with identical brightness as star b Vigo HP58510 with a magnitude of 5.35," reports Eddie Irizarry of the Sociedad de Astronomía del Caribe in Puerto Rico. "But what caught our attention most was Lulin's noticeable speed. Using a telescope, take a good look at the stars that surround Comet Lulin; then look again just 10 minutes later and you will see how Lulin's position has changed. It is amazing how fast this comet is moving!" 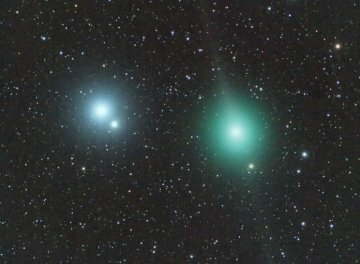 SPEEDING COMET: "On Feb. 21st, Comet Lulin was visible to the naked eye with identical brightness as star b Vigo HP58510 with a magnitude of 5.35," reports Eddie Irizarry of the Sociedad de Astronomía del Caribe in Puerto Rico. "But what caught our attention most was Lulin's noticeable speed. Using a telescope, take a good look at the stars that surround Comet Lulin; then look again just 10 minutes later and you will see how Lulin's position has changed. It is amazing how fast this comet is moving!" 2-20-09 There are no sunspots today. "It made me wonder if I was seeing debris from the recent double satellite collision," says Cordiale. It certainly looked like flying debris (see this animation from Jesus Pelaez of Padilla de Arriba, Spain). But no, what Cordiale, Pelaez and others saw was actually a band of intact geostationary satellites. Geostationary satellites orbit Earth twenty-two thousand miles above the equator, always keeping station above a single point on the ground. While geosats are stationary with respect to Earth's surface, they move with respect to the stars. Viewed through the eyepiece of a star-tracking telescope, the stars are motionless while the "stationary" satellites streak through the field of view like so much debris. Strange but true. From mid-Northern latitudes, geostationary satellites occupy a band of declinations between approximately -5 and -7 degrees. By happenstance, Comet Lulin passed through that band on Feb. 17th and 18th, setting the stage for an unexpected show. "I had never seen anything like it!" says Cordiale. The first gamma-ray burst to be seen in high resolution from NASA's Fermi Gamma-ray Space Telescope is one for the books. The blast had the greatest total energy, the fastest motions and the highest-energy initial emissions ever seen. "We were waiting for this one," said Peter Michelson, the principal investigator on Fermi's Large Area Telescope at Stanford University. "Burst emissions at these energies are still poorly understood, and Fermi is giving us the tools to understand them." managers say the Mars flyby images will be beamed back to Earth on or about Feb. 24th. http://www.comcast.net/data/fan/html/popup.html?v=1035970889 Stragetic Air Command refuses to say anything about the fireball that caused this fire in Texas. Earth on Feb. 14th or 15th. 2-13-09 - Emerging sunspot 1012 is a member of old Solar Cycle 23. COLLIDING SATELLITES: Experts are calling it an "unprecedented event." Two large satellites have collided in Earth orbit. 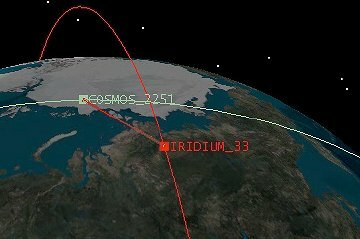 Kosmos 2251 crashed into Iridium 33 on Tuesday, Feb. 10th, approximately 800 km over northern Siberia; both were destroyed. The resulting clouds of debris contain more than 500 fragments, significantly increasing the orbital debris population at altitudes where the collision occurred. The Air Force Space Surveillance Radar is monitoring the clouds as they pass over the radar facility in Texas. We, in turn, are monitoring signals from the radar and you may be able to hear debris "pings" by tuning in to our live audio feed. This is a story that will unfold in the days ahead as researchers study the evolution of the debris clouds and piece together the details of the collision. LISTEN UP: The US Air Force Space Surveillance Radar is monitoring the skies above Texas for echoes from satellite fragments. Try listening on Friday, Feb. 13th between 11:12 and 11:21 CST (1712 - 1721 UT). That's when Iridium 33 would have passed over the radar intact had it not been shattered. NOTE: Other sources are saying this was a deliberate attack by Russia on the United States. Scientists at NASA are keeping close tabs on two clouds of debris from Tuesday collision between U.S. and Russian satellites to determine how much of a risk they pose to the agency's Earth-watching spacecraft and, possibly, the Hubble Space Telescope. The rare collision between a U.S. Iridium 33 communications satellite and the defunct Russian military communications satellite Cosmos 2251 is unprecedented, marking the first time two intact satellites orbiting Earth have accidentally crashed into and obliterated one another, NASA officials said. Their smash-up created two large clouds of space debris that are currently being tracked by the U.S. Space Surveillance Network. The debris poses a greater risk to science satellites than to the International Space Station, which is currently home to two American astronauts and a Russian cosmonaut, since the collision occurred 490 miles (790 km) above Siberia. The space station flies in an orbit about 220 miles (354 km) above Earth. "This is like over 400 kilometers above the station, so we do believe that some of the debris is going down through station altitude. But it's a very, very small minority of the debris clouds," said Nicholas Johnson, chief scientist of NASA's Orbital Debris Program Office at the Johnson Space Center in Houston. "For robotic spacecraft at higher altitudes, the answer's a little bit different. So one by one we'll be looking at those." Earth observations satellites, such as NASA's Aqua and Aura spacecraft in orbit 438 miles (705 km) above Earth, are particularly vulnerable - though the risk of an impact is still low - and there's another satellite in a 497-mile (800-km) orbit just above the impact level, Johnson told SPACE.com late Wednesday. The Hubble Space Telescope orbits the Earth at about 372 miles (600 km), Johnson said. "That's a little bit farther away, but it's a lot bigger too. All that matters," Johnson said of Hubble. "It's about how close you are to the debris cloud and how big you are." It will be weeks before the U.S. Space Surveillance Network pins down an accurate count of the number of individual debris pieces created in the event, but unofficial estimates put the damage somewhere in the 500 count. The U.S. Space Surveillance Network is currently tracking more than 18,000 separate man-made objects and debris at any given time, officials with the U.S. Strategic Command said Wednesday. "This is the first time we've had two intact spacecraft collide, so it is a big deal," Johnson said. "But you know, it's not unexpected." Johnson said that some satellites fly within a few hundred meters of each other every day. Each year, there are about six instances in which old satellites and satellite parts break apart in what scientists call "fragmentation events." Satellite components or spent rocket stages have accidentally collided three times before in the last 20 years. In June 1997, an unmanned Russian Progress cargo ship slammed into Russia's Mir Space Station, damaging a solar array and radiator, and punching a hole in the ship's hull that depressurized one of its modules. Unlike Tuesday's collision, that Progress spacecraft was deliberately heading for Mir, where it was expected to dock in a rendezvous system test. "This was going to happen," Johnson said of Tuesday's accidental collision. "There was no doubt that it was going to happen." Johnson said the chances of a satellite being damaged by the debris from Tuesday's collision are admittedly low, but as the collision itself proved, such things can happen. He does not expect to see reports of many secondary impacts from the event. He pointed out that when China intentionally destroyed one of its aging weather satellites during a 2007 anti-satellite test, the impact created a cloud of more 2,500 pieces of debris. "We don't know if any of them have hit any other satellite, alive or dead," Johnson said of the Chinese test debris. "So the odds are still very small, but they're bigger today than they were two days ago." Debris from two satellites fell over Central Texas on Sunday. Numerous people in Austin reported seeing a fireball in the sky before plummeting to Earth. In addition to Austin, the fireball was seen in Houston and as far north as Plano. Residents from Marlin to Corsicana reported feeling "explosions" as debris from two satellites that had crashed last week began entering Earth's atmosphere. So far, no debris has been found. Reports began coming into the KVUE Newsroom around 11 a.m. Many reported seeing the fireball to the north and west of Austin. Callers said the fireball lasted just several seconds before disappearing. There were initial reports that a plane may have gone down in Williamson County. Emergency crews searched the area around Liberty and Leander for about 45 minutes, but did not find anything. The Federal Aviation Administration in Austin did not believe it was a plane crash. They said all of their planes had been accounted for. There were 2 MAJOR breeches in the magnetosphere last evening. The first one shut down http://www2.nict.go.jp/y/y223/simulation/realtime/ for 3 hours, with a proton blast that went off the charts to about 4.5. That one started at 00UTC which is 5 pm MST. The second started about 11 or so and protons went a bit over 40. You can see this on the BOTTOM proton chart (p/cc's) on the above webpage. These are very different from the geomagnetic storms we have been receiving recently and a sign of great change about to manifest. I suggest if these sheep were felling the 2nd breach, based on the time you gave, also based on where you live, seems like PST? The source of the explosion appears to be a collapsing (or erupting) magnetic filament. The filament was present before the flare, absent afterward. Higher-cadence imagery from the Solar and Heliospheric Observatory (SOHO) may confirm or refute this idea; however, those images have not yet been beamed back to Earth. COMET LULIN UPDATE: Experienced observers report that Comet Lulin has brightened to naked-eye visibility from dark-sky sites. It looks like a pale "fuzzy patch" in the constellation Libra before dawn. Backyard telescopes pointed at the patch reveal a lovely green comet with a rapidly re-growing plasma tail. Browse the gallery for latest photos. Feb 24th is special for another reason: Comet Lulin makes its closest approach to Earth on that date, coincidentally just a few degrees away from Saturn: sky map. In one quick sweep of a backyard telescope, you'll be able to see Titan, Saturn's edge-on rings, and a green comet with an active tail. Mark your calendar! Normal full Moons are fully lit, yet this one has a dusky shading across the north pole. That was the eclipse. "It was not really a sight that would stop someone in their tracks, but I did find it to be much darker than I imagined," reports Navneeth Chandrasekaran from Chennai, Tamilnadu, India. "This photo was taken about 10 minutes before maximum eclipse." VALENTINE'S SHOW? Arctic sweethearts, take note. 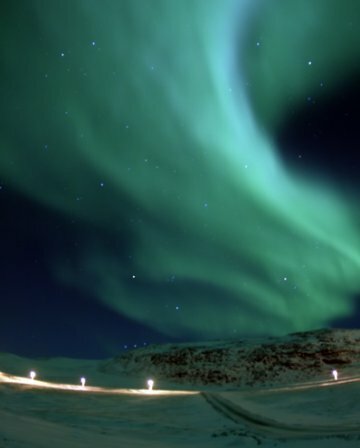 A solar wind stream is heading toward Earth and it might spark high-latitude auroras when it arrives on Feb. 14th. Valentine's Day could end with a sweet display of Northern Lights: gallery. NAKED-EYE COMET: Comet Lulin is now visible to the naked eye from dark-sky sites. 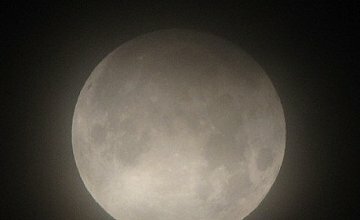 "This morning, I noticed a faint smudge above Zubenelgenubi," reports Jeff Barton from the Comanche Springs Astronomy Campus in West Texas. "I then trained my 9x63 binoculars on the fuzzy patch. Yep, nailed it! I was thrilled to finally bag Comet Lulin without optical aid." Feb. 3 2009) - What may be the smallest extrasolar planet, measuring less than twice the size of Earth, has been discovered orbiting a sun-like star. The world is far hotter than ours, however. And controversy over the size claim has heated up, too. Astronomers using the COROT space telescope detected a small, hot planet as it transited its parent star. The planet, described as "rocky" like Earth, appears as a black dot. "This discovery is a very important step on the road to understanding the formation and evolution of our planet," one astronomer said. Astronomers used the COROT space telescope (a mission led by the French Space Agency, and also involving the European Space Agency and others) to detect the new planet as it transited its parent star, dimming the light from the star as it passed in front of it. The host star is located 457 light-years from Earth, where one light-year is the distance light will travel in a year, or about 6 trillion miles. "For the first time, we have unambiguously detected a planet that is 'rocky' in the same sense as our own Earth," said Malcolm Fridlund, ESA's COROT Project Scientist. "We now have to understand this object further to put it into context, and continue our search for smaller, more Earth-like objects with COROT." He added, "This discovery is a very important step on the road to understanding the formation and evolution of our planet." Sara Seager, an astrophysicist at MIT who was not involved in the discovery said, "My first thought is that it's extremely exciting because we've been waiting to find a planet that we can really call rocky. I would just caution that more information, more data, is needed." For instance, the discovery has yet to be published in a peer-reviewed journal, and not much information about the planet has been released by COROT scientists. 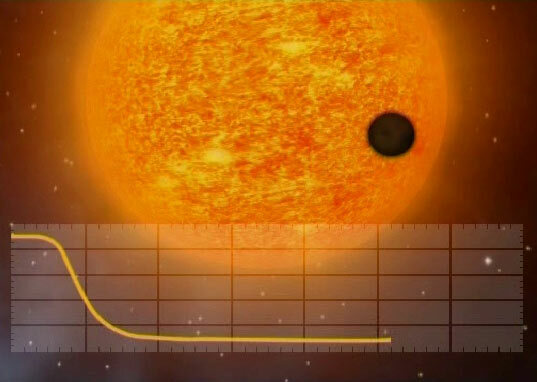 Seager says in order to confirm an exoplanet is rocky, scientists need to nail down its mass and radius (or the combination of size and density, or mass and density). "It looks like the mass is not well-determined and so that's why they're saying they're not sure what the density is," Seager told SPACE.com. "They think it is terrestrial-like. It might have water ice, or it might have rocks, but it's certainly not a gas giant." COROT scientists estimate the planet ranges from 5.7 to 11 Earth masses. One big difference in the newfound planet compared to Earth: COROT-Exo-7b is located very close to its star, orbiting once every 20 hours. Its temperature is so high, ranging from 1,832 to 2,732 degrees Fahrenheit that the researchers say the exoplanet could be covered in lava or water vapor. The density of the planet is still under investigation, though scientists say it may be rocky like Earth and covered in liquid lava. COROT-Exo-7b may also belong to a class of planets that are thought to be made up of water and rock in almost equal amounts. Given the high temperatures measured, the planet would likely be a very hot and humid place. "Finding such a small planet was not a complete surprise," said Daniel Rouan, researcher at the Observatoire de Paris Lesia, who coordinates the project with Alain Leger, from Institut d'Astrophysique Spatiale. "COROT-Exo-7b belongs to a class of objects whose existence had been predicted for some time." Very few of the more than 300 exoplanets found so far have a mass comparable to that of Earth and the other terrestrial planets — Venus, Mars and Mercury. That's because terrestrial planets are extremely difficult to detect. Of the Earth-like planets detected, this is the first one spotted using the so-called transit method, which can yield both the planet's mass and radius. Other methods just reveal the planet's mass, Seager said. The newfound planet's size status is also questioned. When astronomers study planets, they're interested in both mass and diameter. "The claim that it is the 'smallest exoplanet' found to date is not correct," said planet-formation theorist Alan Boss of the Carnegie Institution of Washington. "It is the smallest mass exoplanet found to date that transits, but other hot super-Earths have been found that do not transit but have lower masses." Boss was not involved in the current discovery. For instance, he adds Gliese 876 d has "a minimum mass of 5.9 Earth masses and a best estimate for the true mass of 7.5 Earth masses." Most of the methods used so far are indirect and sensitive to the mass of the planet, which is why bigger worlds are easier to detect. COROT can directly measure the size of a planet's surface, which is an advantage to astronomers. In addition, because the probe is in space, it has longer periods of uninterrupted observation than from the ground. FIREBALL ALERT: During the next 48 hours, two big pieces of space debris are expected to re-enter Earth's atmosphere: a 2000 kg Centaur rocket body on Feb. 3rd and a 2500 kg Delta III rocket body on Feb. 4th. People living along the reentry ground tracks should be alert for fireballs. Ground tracks: Centaur, Delta III. This story is for all those who want to know more about new space discoveries. 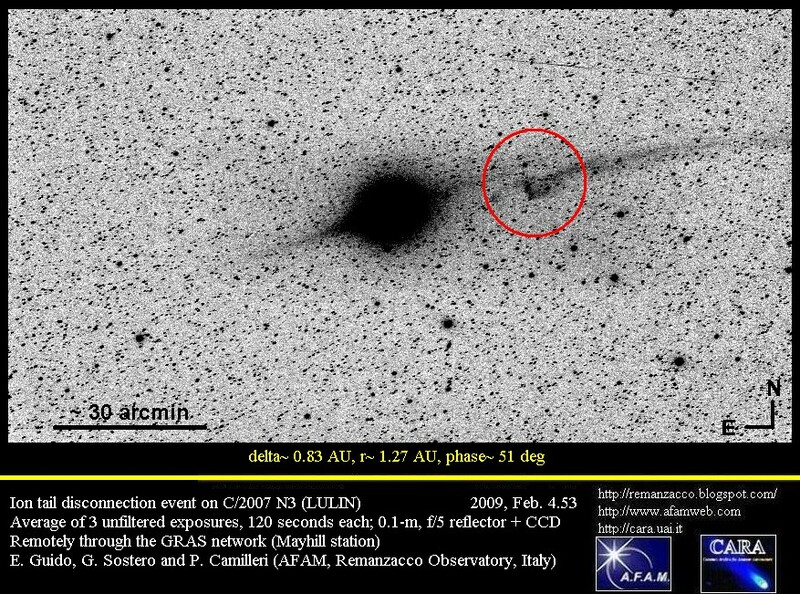 Recently, an Italian astronomer has spotted a comet from the so-called Jupiter family on the night sky. Astronomer, Andrea Boattini, who has already broken a 150-year-old record of spotting seven comets last year, has now claimed that he spotted ninth comet last week while scanning currently visible Near Earth Objects (NEOs). ’I wasn’t too sure it was a comet straight away because it was hazy but the skies cleared a bit later and allowed me to confirm the comet’s nature,’’ said Boattini. The 39-year-old Italian works at Arizona’s Mount Lemmon Observatory on a NASA programme and searches for objects in space that could be dangerous to our planet, Earth. The new comet has the technical tag C/2009 B1. However, it is named after who has discovered it. The comet, which belongs to the so-called Jupiter family, is in the Andromeda constellation and bypasses Earth once in every 17 years. 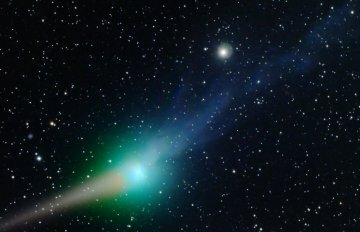 Anyone with a medium-sized telescope can observe the comet until March end. The comet, which belongs to the so-called Jupiter family, is in the Andromeda constellation and passes by Earth once in every 17 years. 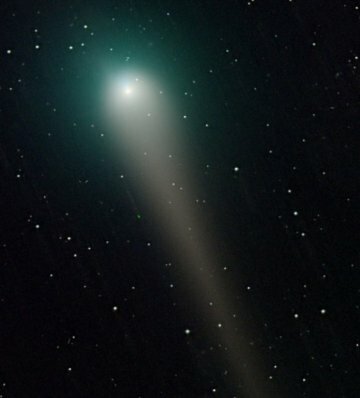 Anyone with a medium-sized telescope can observe the comet until March end. 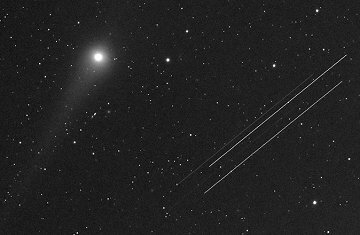 COMET LULIN RIGHTENS: Veteran sky watcher Mariano Ribas of Argentina has been monitoring Comet Lulin in the skies of Buenos Aires. "In the past ten days, the comet has brightened by almost 60% (half a magnitude) to magnitude +6.5," he reports. "Even with our heavy urban light pollution, the comet is an easy target for small telescopes and binoculars. Soon, I believe, it will become a naked-eye object for people in the country." Comet Lulin is approaching Earth for a 38-millon-mile close encounter on Feb. 24th. llation Libra. A date of note is Feb. 6th when the comet passes by double star Zubenelgenubli. Zubenelgenubi is not only fun to say (zuBEN-el-JA-newbee), but also it is a handy guide. You can see Zubenelgenubi with your unaided eye (it is about as bright as stars in the Big Dipper); binoculars pointed at the binary star reveal Comet Lulin in beautiful proximity: sky map.